This blog is for anything I'm thinking about that might be worth sharing. If you like something here, please let me know. You can email me on pb204@virginmedia.com, replacing "pb" with the full Latin word. I prefer land to niggers...the natives are like children. They are just emerging from barbarism...one should kill as many niggers as possible. Thus a petition calling for the removal of a statue of Cecil Rhodes from Oriel College, quoting Rhodes' words against him. ...but Cecil Rhodes, he'll keep their noses to the grindstone.' 'I prefer land to niggers,' he says. They say he's going to parcel them out, and make them work on our lands whether they like it or not. The last eight words I can find only in various forms of the same synthetic quotation. The earliest of them seems to Adekeye Adebajo's Opinion piece attacking Rhodes in 2006: there the three parts are separate quotations. When the same writer recycled his work in 2011 it was a single quotation, with ellipses. By 2015 the second ellipsis had been replaced with '[and]'. This is not the work of a scrupulous scholar. ...we saw the officer in charge of police, and he said that a patrol was going out that very day to attack the kraal on the kopje under which we had spent the night. He spoke of a fight they had had a short time before, and on Rhodes asking how many were killed he replied, 'Very few, as the natives threw down their arms, went on their knees, and begged for mercy." "Well," said Rhodes, "you should not spare them. You should kill all you can, as it serves as a lesson to them when they talk things over at their fires at night. They count up the killed, and say So-and-so is dead and So-and-so is no longer here, and they begin to fear you." Having found all this, I had the right search terms to discover that I wasn't the first. Madeleine Briggs points out that Adebajo assembled the three (mis)quotations from Paul Maylam's biography. Briggs reports that Schreiner apparently got her quotation from another of Rhodes' speeches in Cape House, misremembered by her. Mr Hofmeyr, leader of the Bond, opposed it with the remark that he was not going to vote for a bill which made the lashing of his old coloured servant woman compulsory if she should be convicted of bringing him his coffee half an hour late. Rhodes' speech in 1894, horribly patronising but apparently benevolent, was in support of the Glen Grey Act, which replaced communal land ownership with smallholdings for a small number of natives, displacing the rest. The individual titles were small enough so that they failed to meet the property requirement of Rhodes' Franchise and Ballot Act, and land accumulation was prohibited. It was a progenitor of apartheid. What then of the statue? I'd keep it. We should remember the past, and we should remember that we put up statues in celebration of it. But that's easy for me to say: if the members of Oriel want it gone, so be it. Last weekend's third-round FA cup matches brought with them a seasonal outbreak of pundits complaining that Premier League clubs weren't taking the competition seriously enough, and proposing impractical or foolish ways to change that. The reason why the Premier League clubs are not that interested is simple: it's the money. The reward for finishing in the top four places (out of 20) in the Premier League is entry to the Champions League, where a team now receives €12m simply for playing in the group stage, and English teams roughly double that from their share of the 'Market Pool'. The penalty for finishing in the bottom three places is relegation from the Premier League, with a massive reduction in revenues for at least one year - the bottom club last year was paid £64.9m for its efforts, gate money aside: this year the same team, now playing in the Championship, will get a £24m 'parachute payment' instead. Even for a mid-table team, Premier League results are worth a lot of money. Last year, there was a 'Merit Payment' of £1,244,898 per place. The difference between 5th and 17th place in the final table has averaged 28 points over the last ten years — 2.33 points per place. That makes a Premier League win, worth 3 points, carry an expected financial reward of £1.6m . Compare that with FA cup prize money. The reward for winning a third-round match is £67,500. The total payment for winning the cup — six matches — is £1,777,500 . It makes no financial sense for a Premier League team to tire its best players, and risk injuring them, in pursuit of such relatively small sums. If you want Premier League teams to take the competition seriously, you have to pay them for it. A win bonus of £1.6m a match would be the right sort of sum. That's a lot of money: it would cost £100m to pay it to the winner of each of the 63 ties played from the third round onwards (some of the winners would be clubs outside the Premier League, who would surely appreciate the income). But the Premier League's annual television revenues under its latest deals (starting next season) will be £2.8bn per year or so. By redirecting three and a half percent of that it could make the FA Cup — the world's oldest football compeition — into something worth watching. How about it? I don't watch Question Time, because decades ago when I did I used to find myself shouting at the television. But last night, driving down the A1, I listened to it on the radio (and when at one point I turned it off, my daughter said she was interested in it so I switched it on again). You can watch it here (but you ought to have something better to do). The panel was Conservative minister Anna Soubry, Labour shadow minister Chuka Umunna, SNP MP Tommy Sheppard, UKIP MEP Louise Bours, and journalist Rachel Johnson, with David Dimbleby as presenter. The politicians seem better than I remember at seeming likeable, but the level of debate is no higher. The program started with a discussion of the effects of the "living wage" and tax credit measures in this week's budget. Umunna started by pointing out that Cameron promised, a few months ago on the same programme, not to cut tax credits. Soubry flatly denied it. Of course she was wrong, and Dimbleby might have said so, since it was he who put the question to Cameron, but either he'd forgotten or he chickened out. None of the panel talked about the effect of the new minimum wage structure on employers and the patterns of employment they will now favour, or the effective marginal tax rate of 78% imposed on some claimants by the sharper taper of tax credits (it's OK to examine these things from the left). Later, Bours and Johnson gave us their analysis of the Greek referendum. The proposed package, Johnson informed us, would be "a bailout for the bankers, again". "You're right, absolutely", Bours confirmed. Well, the 2012 package sorted out the debts to commercial banks, in return for their accepting a write-down of 53.5% of face value, together with reduced coupons and extended maturities. So that was a fraction of a bailout. This time the debts are owed almost entirely to the Eurozone and the IMF, so if a bailout benefits the creditors, those creditors are the people of the contributing countries. A member of the audience wanted to "tax the bankers" to pay for it, and Sheppard suggested specifically a levy on bailed-out banks: he didn't say if he would exempt Greek banks from that. Johnson and Bours agreed that Greece would have no great problems reverting to the Drachma (except, I say, that they'd have nothing to pay for imports with in the months it took for the new currency to find a foreign exchange level). Umanna then observed that "it's not as simple as...bankers against the Greek people" and he and Soubry spoke sensibly but vaguely. Then there was a discussion of student grants and loans, the lowlight of which was Bours arguing with a nursing student in the audience about the content of her university course - not what the content should be, but what it is. Bours then repeatedly disparaged a degree in "David Beckham studies" - a horror largely of her own imagining. At the end the panel discussed the next leader of the Labour Party, most of them expressing their disappointment that Umunna is no longer standing. Bours put her hand on his shoulder "we couldn't wait to see Chuka sitting in a working men's club drinking a pint of stout". Two years ago I wrote a post in response to Nigel Farage's question about his party's potential MPs "could we be worse?". Having listened to this programme, and watched the ending, I can add that, criminality and defections aside, the answer is "yes you are". Three years or so ago I wrote several posts about the financial crises in Greece, in which my view of the bail-out was that "it can't work and it won't work". Well, it couldn't, but I was wrong to think that "this could break down very quickly." In fact, the Eurozone did an outstanding job of kicking the can down the road, keeping Greece afloat for three years without ever coming close to fixing anything. The difficulty with this strategy was that the electorate in Greece hated the austerity imposed on it, and the electorates in the rest of Europe hated paying for Greek pensions. The beginning of the end was the election in Greece early this year of the anti-austerity Syriza party, which was committed not to accept the inevitable terms of the next bail-out package. Meanwhile, the rest of the Eurozone had successfully reduced the vulnerability of its banks and debtor nations to a Greek default. The recent bail-out negotiations between the Eurozone finance ministers and the Greek government (represented by prime minister Alexis Tsipras and finance minister Yanis Varoufakis) have been a game of chicken. Both sides know that a Greek default would be horrible for both of them, but the negotiations have failed because the Eurozone isn't quite scared enough of the consequences of default, and Tsipras is scared enough of the consequences from his party and his electorate of giving in to Eurozone demands. Tsipras has now fallen back on holding a referendum next Sunday to find out if the Greeks want him to give up the policies they elected him on, which would be admirably democratic were it not for the fact that the government needs to pay €1.5bn to the IMF on Tuesday, and apparently it hasn't got it. Oh well, not paying the IMF is embarrassing — Greece is richer than most IMF members — and could be treated as a default by the Eurozone (page 33 here.) But neither the IMF nor the EU need rush to do anything about it. So in practice a Yes vote in the referendum could still result in a bail-out which enables Greece to meet its interest payments. But there are more immediate problems. First Robert Peston for the BBC reported that "the European Central Bank's governing council is expected to turn off Emergency Liquidity Assistance (ELA) for Greek banks at its meeting later today", and later the ECB issued a statement, saying that it would "maintain the ceiling to the provision of emergency liquidity assistance (ELA) to Greek banks at the level decided on Friday (26 June 2015)". Which is a gentle way of saying that it would not increase the ceiling — it would allow no new ELA. ELA is necessary because there's a run on the Greek banks, whose depositors reasonably fear that the banks may run out of cash or the government may redenominate deposits into a new, rapidly depreciating currency. Withdrawals take two forms: cash or transfers to banks outside Greece, and both need bank reserves at the Bank of Greece, which the Greek banks haven't got, either to buy banknotes or to fund interbank transfers via the Eurozone's TARGET2 system. However, contrary to many reports, ELA is not money supplied to Greece by the ECB. It's provided by the Bank of Greece; all the ECB does is to authorize it. And it doesn't cost the Bank of Greece anything either — the money it lends the banks is just an accounting entry, the banknotes it can print in exchange for owing money to the ECB, and TARGET2 is the same without the printing. The banks borrowing the money have to post collateral for the money they're borrowing, because it's suppose to help banks which are illiquid but not insolvent. I suppose the Greek banks are in fact solvent so long as their billions of Greek government T-bills are treated as sound (which is absurd, but the ECB hasn't said so up to now). I wonder what would happen if Greece chose simply to continue with ELA, without the ECB's permission. That would be a gross breach of the rules, but when you're about to default, you might live with that. What would the ECB do? I suppose it would suspect Greek access to TARGET2, but it's not clear to me what it could do beyond that, other than promise future non-cooperation. If it's not willing to defy the ECB, Greece can keep its banks afloat only by redenominating their liabilities into a new currency - Grexit. I suppose the government won't take that step before the referendum, so there would have to be severe limits on withdrawals and transfers, or simply bank closures, for the next week. The other problem is that the Greek government has salaries and pensions to pay. Varoufakis said a month ago that he'd rather pay the pensioners than the IMF, and my guess is that they've got the money somewhere for this month. If I'm wrong, they're faced with the same two choices: raise money by selling the banks T-bills paid for with money created and loaned by the Bank of Greece, all in defiance of the ECB, or pay the pensions in a new currency. News site getting it wrong in the headline but right in the text without one having to scroll down: Reuters. News sites getting it right: BBC, Guardian. My previous post discussed this paper, and its claim that two thirds of cancer types are largely unaffected by environmental or hereditary carcinogenic factors. While I'm unimpressed by the paper, the idea behind it is interesting, so here's my analysis of its data. The hypothesis is that "many genomic changes occur simply by chance during DNA replication rather than as a result of carcinogenic factors. Since the endogenous mutation rate of all human cell types appears to be nearly identical, this concept predicts that there should be a strong, quantitative correlation between the lifetime number of divisions among a particular class of cells within each organ (stem cells) and the lifetime risk of cancer arising in that organ." So let's suppose that each stem cell division gives rise to cancer with a small probability p. Then if there are n lifetime divisions, the probability that none of them leads to cancer is (1-p)n, so the lifetime risk of cancer, R, is 1 - (1-p)n. We can rearrange that to find an expression for p, ln(1-p) = ln(1-R)/n. For very small p, ln(1-p) = -p, so p = -ln(1-R)/n. If we plot ln(1-R) against n we should expect to find that for all the organs where carcinogenic factors are absent the values fall on the same straight line through the origin. Here's the graph, which looks not unlike the one in the paper. The correlation between the x and y data series is 0.787, again not unlike in the paper. But the slope of a line through the points is not unity, nor is there a subset of points at the bottom of the envelope of points for which the slope is unity. To explore further how well the data fit the model, I've backed out implied values of p for each cancer type. Here's the problem. If the data matched the theory, there would be a group of cancer types at the left end of the chart with similar implied probabilities. It seems in particular that the risk of small-intestine adenocarcinoma is anomalously low. Let's try an alternative theory: that for every tissue type, some fraction of stem cell divisions, call it α, are affected by environmental or heriditary influences in a way which gives them a probability, call it q, of causing cancer. q is the same for all tissue types. The remaining divisions carry negligible risk by comparison. Somewhat arbitrarily, we'll assume α is one for the cancer with the highest implied probability in our previous analysis: that is, q is equal to the p implied for Gallbladder non-papillary adenocarcinoma. We can now back out a value of α for each cancer. Well, it's a simplistic theory, but it does have the advantage over our previous model that it fits the data. It seems to me that picking out gallbladder cancer as high-alpha is a plus for this model, because that cancer has a peculiar geographic spread which can only be due to environmental or hereditary factors. And I've been mischievous. In this theory, despite the correlation in the input data between stem cell divisions and cancer risk, every cancer is caused by environmental or hereditary factors. That doesn't match my preconceptions, so I looked for the story online. The Independent and the Telegraph agree. So does the Mail. And the Express. And the Mirror. Reuters' headline agrees, but its story suggests something a bit different - that two thirds of an abitrary selection of cancer types occur mainly at random. The BBC speaks unambiguously of "most cancer types" and so does The Guardian. The press release which must have given rise to this story features the phrase "two thirds of adult cancer incidence across tissues can be explained primarily by 'bad luck'". I can't make much sense of "cancer incidence across tissues", so I can't blame the journalists for stumbling over it likewise. But the reporters who got the story right must have managed to scan down to the paragraph where the press release explains that the researchers "found that 22 cancer types could be largely explained by the “bad luck” factor of random DNA mutations during cell division. The other nine cancer types had incidences higher than predicted by "bad luck" and were presumably due to a combination of bad luck plus environmental or inherited factors." I emphasize that "two thirds of cancer types" is not at all the same as "two thirds of cancer cases". Two rare cancers apparently unrelated to environmental factors will count for far fewer cases than one common cancer in the other category. So what of the paper behind the press release? Here's the abstract, with a paywalled link to the whole paper. Or you can 'preview' the paper for free here, to the extent your conscience permits. Supplementary data and methodology descriptions are here. The hypothesis behind the paper is that cancer is to a large extent caused by errors arising during stem cell division, at a rate which is independent of the tissue type involved. The researchers therefore obtain estimates of the lifetime number of stem cell divisions various tissue types, and plot that against lifetime cancer incidence, obtaining a significant-looking scatter plot (Figure 1 in the published paper). So far so good. But they've used a log-log plot, necessary to cover the orders of magnitude variations in the data. Now, if you think, as the researchers apparently do, that cancer risk is proportional to number of stem cell divisions, it follows that the slope of a log-log plot should be unity. It isn't, by eye it's more like two thirds. The researchers, busy calculating a linear correlation between the log values seem not to have noticed this surprising result. Instead they square the correlation to get an R2 of 65%, which may (it's not clear) be the source of the "two-thirds of cancer types" claim. If so, that claim is based on a total failure of comprehension of what correlation means. Imagine a hypothetical world in which cancer occurs during stem cell division with some significant probability only if a given environmental factor is present, and that environmental factor is present equally in all tissue types. 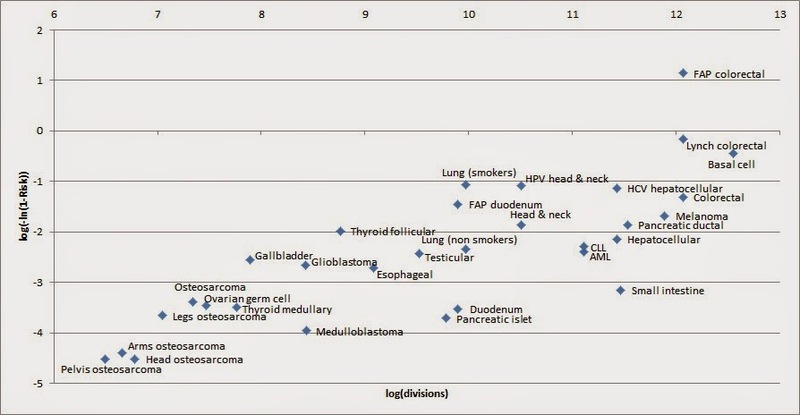 In this world cancer incidence across tissue types is perfectly correlated with the number of stem cell divisions, but nevertheless all cancer is caused by the environmental factor. It's simply impossible to say anything about the importance of environmental factors in a statistical analysis without including those factors as an input to the analysis. Shorn of the detail, it's the product of two logarithms. How does that make sense? Multiplying two logarithms is bizarre; for all ordinary purposes you're supposed to add them. For this analyis, a simple measure would seem to be the ratio of lifetime incidence to stem cell divisions, or you might prefer the log of that ratio, which would be the log of the incidence minus the log of the stem cell divisions. The Supplement attempts to justify multiplying the logarithms by explaining why dividing them woudn't make sense. Which is a bit like advocating playing football in ballet shoes because it would be foolish to wear stilettos. Whatever ERS calculation you used, the clustering method would still divide the cancers into two groups, because that's what clustering methods do, but different calculations would put different cancer types in the high-ERS group. If you want, as the senior author does, to draw conclusions from composition of the high-ERS cluster, you need a sound justification for your ERS calculation. To its credit, The Guardian has published a piece pointing out the correlation misunderstanding. This piece is also highly unimpressed by the paper, and this review of it has mixed feelings. Me, I suppose the underlying idea has some truth in it. But the methodology is the worst I've ever seen in a prominently published paper. Update: Bradley J Fikes, author of this piece in the San Diego Union-Tribute, complains in comments here that the title of this post is ill-chosen. He points out that he didn't write his story simply from the press release, but checked it with John Hopkins before it was published. He's got a point about the title: more than half of what I say here is criticism of the paper not of the press release.